The overall volume of coral in Sekisei Lagoon in southwestern Japan near Okinawa had already plunged by 80 percent since the late 1980s due to rising water temperatures and damage caused by coral-eating starfish. Now only 1.4 percent of the lagoon, which stretches over 67.89 square kilometres, is in a healthy condition, the environment ministry said, after it was hit by mass bleaching in 1998, 2001, 2007 and most recently 2016. 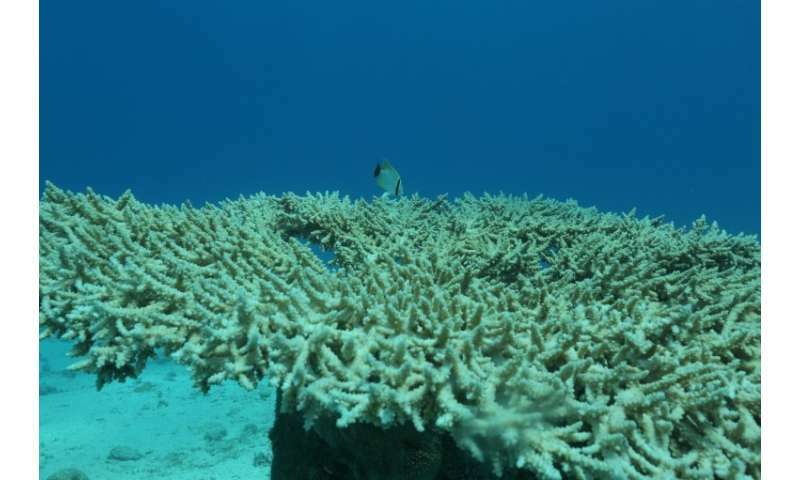 "If coral reefs don't recover, it means a loss of rich fauna for a variety of creatures and would have grave impact on the ecosystem in the region," ministry official Chihiro Kondo told AFP on Friday. For the first time since 2008, the ministry analysed satellite photos and information from some 1,000 monitoring sites for the Sekisei Lagoon and two other reefs around the Ishigaki and Iriomote islets in Okinawa. The ratio of healthy corals stood at 14.6 percent in 1991 but dropped to 0.8 percent in the 2008 survey, Kondo said. Two other neighbouring lagoons had similar results with the ratio of healthy areas around one percent. "But the latest study shows that corals haven't recovered much since 2008, presumably partly because of the 2016 bleach," Kondo said. One of the worst mass bleaching episodes on record took place in 1998 when the El Nino phenomenon was exceptionally strong, affecting reefs in 60 tropical countries. Coral reefs are also under pressure from ocean acidification linked to CO2 emissions, scientists warn. Corals make up less than one percent of Earth's marine environment, but are home to more than 25 percent of marine life. Why do you say that, do you have any evidence to the contrary? So what was the "actual" rise in sea temperature in the oceans of Japan? A change of 2 C doesn't kill coral and neither does 3 millionths % change of ocean acidity hurt coral. It is adaptable. So instead of conjecture this charlatan should do some real research to identify the cause. The pH scale is proportional to the log of the hydrogen ion (or hydronium) concentration, so even a very minor change in pH represents a large change in the relative concentration. Your number is so very suspiciously small that unless you provide a citation to a legitimate peer-reviewed paper, we have to assume that you are a liar. "very minor change in pH represents a large change in the relative concentration. " no you moron! Only if increasing from billionths to millionths is relatively large. Instead of stressing your brain calling names, verify it for yourself by doing the math. If alkalinity decreases from 8.3 to 8.2 then how many +H have you added per mole? Being a log scale you can do. You don't need a citation for basic math and chemistry. appreciable amount? NO Proof +H increases greatly with latitude yet calcium carbonate is still created. It is very easy to see the effect of this if you aren't one hell of a d*mb a*s.
no you moron! Only if increasing from billionths to millionths is relatively large. 4- science works both ways. if you have a valid means to prove your argument you wouldn't be here on a news aggregate attempting to sway the reader to your perspective.